Developing a grassroots community program has so many rewarding and fun parts to it: seeing smiles on kid’s faces as they learn how to hand-wash with soap, sponsoring safe water systems to many villages in desperate need of a suitable water source for drinking, and laughter as health professionals practice CPR and life-saving measures on each other to ensure that their littlest patients are always safe in their care. One of the less exciting but just as important parts of a program is, yes, the paperwork. Evaluating a program ensures that your generous donations have been put to good use, and are effectively working to reduce waterborne illnesses and increase access to safe drinking water in rural villages in Vietnam. Sure, it’s not nearly as fun as singing songs about health with preschoolers. But program evaluation is really the backbone of any sustainable community health program, and MEDRIX highly values sustainability and effectiveness in all of our partnerships and programs. Right now, in addition to preparing for back-to-school workshops and safe water systems being installed in more schools, our partners at the Center for Preventative Medicine in Thua Thien-Hue are hard at work visiting the villages and clinics where our programs take place. 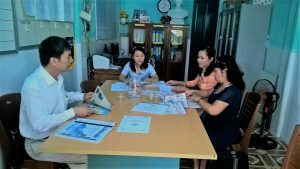 Led by public health expert Dr.
Hoang Ha Tu, public health researchers are surveying families for their feedback on the community health efforts led by MEDRIX partners in TT Hue. This on-the-ground research will be vital as we develop our next phase of our water and hygiene partnership with the Center for Preventative Medicine. Our workshops always get outstanding feedback from parents and teachers. But the long-term effects on health are just as important if we want to make a difference in Vietnam. We’ll be excited to share the results of these evaluations with you as soon as we receive them! You are truly our partners in this program, just as much as our partners in Vietnam who carry out the work. Without your support and your care, MEDRIX wouldn’t be able to reach more and more families in Vietnam every year. 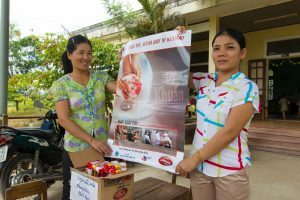 We value your input and your support, and the families in Vietnam who are recipients of this program are always quick to say, “Please give our thanks to the dear donors!” We sincerely thank you for your support in this ongoing effort to improve health and livelihood in Vietnam!